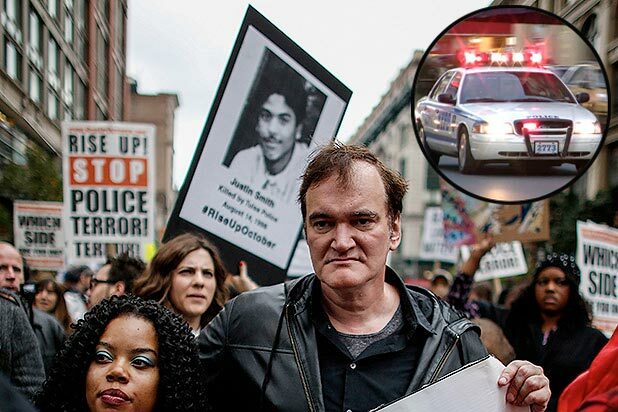 The National Association of Police Organizations on Tuesday rejected Quentin Tarantino‘s efforts to clarify his comments about police brutality, calling the director’s explanation “ludicrous” — while another police union told TheWrap its boycott of Tarantino’s films was still on. “He makes his living as a master craftsman of scene and setting, for him to claim now that he wasn’t perfectly aware that his message was precisely ‘cops are murderers’ is ludicrous,” NAPO executive director Bill Johnson told TheWrap. Meanwhile, the national office of the Fraternal Order of Police told TheWrap the organization is maintaining its boycott of Tarantino’s forthcoming Weinstein Company release “The Hateful Eight,” due in theaters on Christmas Day in limited release. On Tuesday, Tarantino told the Los Angeles Times “all cops are not murderers” in an attempt to quell the boycott — which includes police groups in Los Angeles, New York, Philadelphia, Chicago and national chapters representing sworn peace officers. Also Read: Tarantino's 'Hateful Eight' Headache: Will Police Boycott Impact Box Office and Awards? 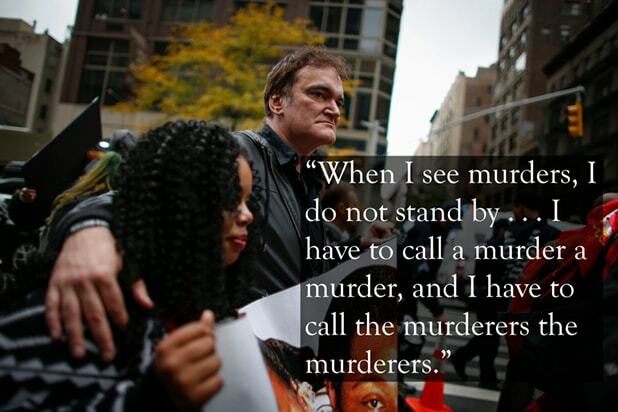 Tarantino participated in an anti-police brutality rally in New York on October 24. The filmmaker angered police on both coasts when addressing a crowd of protesters at the rally in Manhattan’s Washington Square Park. “When I see murders, I do not stand by… I have to call a murder a murder, and I have to call the murderers the murderers,” the “Django Unchained” director said. After calling some police officers "murderers" in a rally protesting police brutality, Tarantino and his movie "The Hateful Eight" became the target of a boycott by police unions across the country. Tarantino raised eyebrows when he seemed to diss Ava DuVernay's "Selma" in an interview with writer Bret Easton Ellis for T Magazine. The director seemed to compare the Oscar-nominated film to a made-for-TV movie by saying that it "deserved an Emmy." After film reviewer Jan Wahl took issue with Tarantino's assertion that kids older than 12 would enjoy the violent "Kill Bill," the director told Wahl that she needed to separate movies from the real world. In a contentious interview with Channel 4 anchor Krishnan Guru-Murthy, the Oscar-winner refused to answer a question about the link between movie violence and real-life violence. "I'm already on the record," he said. "I have explained this many times in the last 20 years." Tarantino shocked the media when he used the N-word in the press room after collecting a Golden Globe for 2013's "Django Unchained." Tarantino made a cameo in "Pulp Fiction" as Jimmie Dimmick, who helps Jules and Vincent dispose of Marvin's body. During his brief appearance, the writer-director drops the N-word multiple times, which drew a significant amount of criticism upon the film's release two decades ago. Tarantino has been clashing with director Spike Lee for years over Tarantino's use of the N-word in his films. The feud goes as far back as the release of "Reservoir Dogs" in 1997 when Lee said he had a "definite problem" with the language in the film. Amid nationwide police boycotts of “The Hateful Eight” sparked by the filmmaker’s decision to speak out against police brutality, TheWrap remembers other times Tarantino’s mouth got as much attention as his movies.